There is nothing worse than sitting down to watch a couple of YouTube videos to just be bombarded with ads, so here is the solution. Step 2. 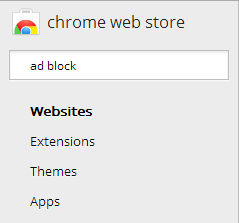 Click in the search bar and type Ad Block. Step 3. Scroll down to Adblock for YouTube then click the button that says ADD TO CHROME. Step 4. When the Confirm New Extension window pops up click Add. Step 5. To verify that this has worked you will now see a tick on the application. CONGRATULATIONS! You will not longer be seeing ads when you are on YouTube!